Edition Size - 25 THE REMARQUES US $450. Caught off guard the Americans rushed in reinforcements, including the 82nd and 101st Airborne Divisions encamped near Reims, over a hundred miles away. Exhausted by the fighting in Holland during Operation Market Garden, they had been sent to Reims to recuperate. They never got the chance. Thrown into the thick of the action the 82nd helped to blunt the Germans’ advance to the north, whilst at Bastogne, a pivotal town further south, the 101dt, surrounded, out-numbered and besieged, refused to surrender. The line held and three days before Christmas the panzers ground to a halt, stalled by lack of fuel. First Lieutenant EDWARD J. LOPEZ DFC PH Flew P-47s with the 365th Fighter Group and later the 387th Fighter Squadron during the Battle of the Bulge. Colonel HERBERT L. PREVOST DFC Flew P-47s with the 387th Fighter Squadron in the Ardennes and was awarded the DFC for helping to destroy seven tanks, three armored vehicles and five trucks in a single day. Private 1st Class ARTHUR ‘ART’ PETERSEN Jumped on D-Day with Fox Company, 506th PIR, 101st Airborne,. Wounded during Operation Market Garden, he re-joined in time to defend Bastogne. Staff Sergeant LEO A. DUMOUCHELLE Served in the 82nd Airborne Division with the 307th Airborne Engineer Battalion (C). Wounded in Belgium in September 1944 he returned to fight in the Battle of the Bulge. Captain DEAN McCANDLESS Made four combat jumps with the 505th PIR, 82nd Airborne at Sicily, at Salerno, on D-Day and finally Operation Market Garden before fighting during the Battle of the Bulge. He was awarded the Silver Star and Purple Heart. Captain WAYNE COLEMAN Flew P-47s with the 78th Fighter Group on dive-bombing and strafing missions in support of the Normandy invasion and in the Ardennes. He later converted to P-51s and shot down three Fw190s in a single mission and an Me262 jet. 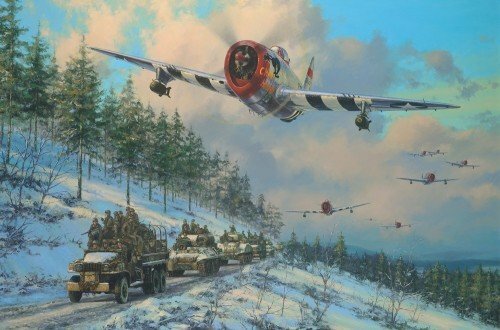 THE GICLEE STUDIO PROOFS Using the very latest high-deﬁnition giclée technology Anthony Saunders’ fabulous painting THUNDER IN THE ARDENNES is faithfully replicated on canvas. Issued pre-stretched, each Giclée Studio Proof is hand-numbered and signed by the artist.